It is so good to hear from Doug about what God is doing through Pastor Diogene and his outreach ministry team. The nightly meetings have continued this week with many more responding to the invitation to follow Jesus. This morning Diogene purchased 400 new Bibles to present to the 400 new believers. Yesterday from 1pm to 4pm they had meetings for all new believers. They divided them into three groups; children, young adults and older adults and began teaching them the foundational truths of the faith. They will continue these classes for several weeks. Thank you for your prayers for these new brothers and sisters in Christ. What a joy it is to see God at work in their lives! The food distribution is also continuing. Yesterday and today the distribution team sent out several loads of packaged up rice, beans, pasta and cooking oil. God is using this avenue to open the hearts of these people to receive the Living Bread of Life, our Lord Jesus Christ. Thank you so much for your support and partnership with us. God is using you to really make an eternal difference in these Haitians’ lives. 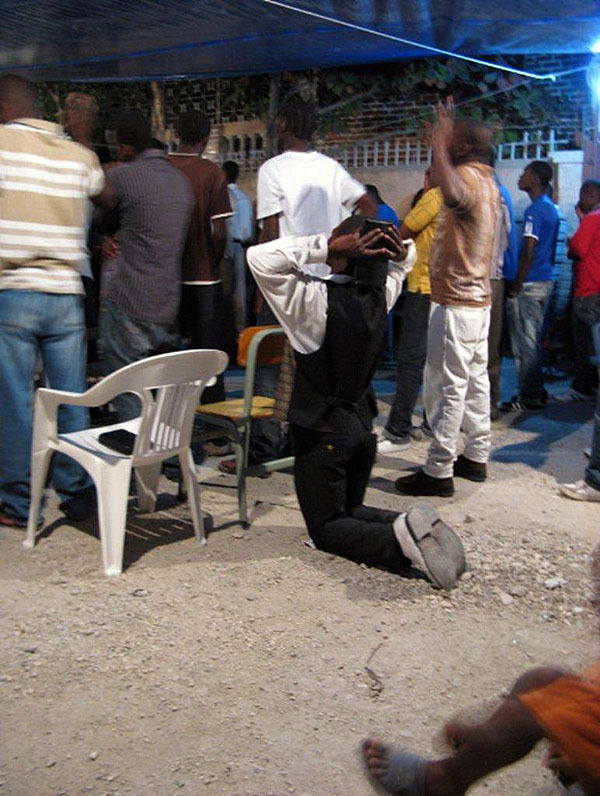 After a week-long evangelistic crusade in Port-au-Prince, Pastor Diogene’s church met Sunday morning (February 14) at 6am. And they worshipped, prayed, and listened to God’s word until noon. Near the end of the service, Diogene issued another invitation to respond to the gospel, and 75 people came forward. Following this, Diogene asked that anyone who had put their faith in Christ during the previous week come forward. The total was more than 300 souls! 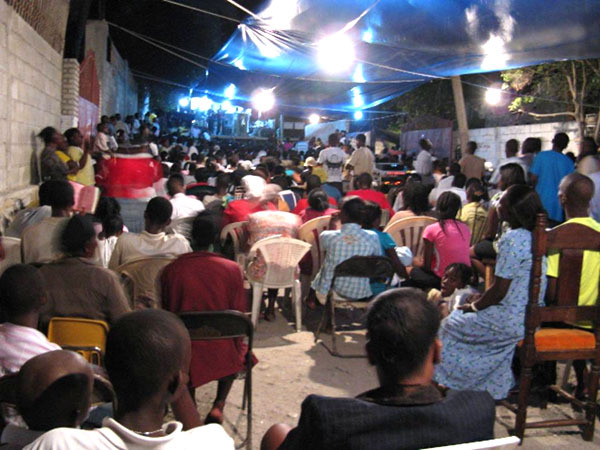 Sunday evening they met again for a time of worship and celebration for the work God is doing in Haiti right now. And they have decided to extend the crusade for another week! Doug took these photos of the crusade. Doug made it to Haiti last night about 10:00. This morning he received a short report on the crusade. Last night over 2000 attended. The first five nights over 200 prayed to receive Jesus as Savior. Pastor Diogene and his ministry team have connected each of these new believers with a big spiritual sister or brother. The expectation is that there will be many more in attendance tonight and tomorrow night. Please continue to pray for a great harvest. God is certainly working in the hearts of many — drawing them to himself. It is so great to see His purpose accomplished in the midst of so much tragedy. We give all the glory to our God and King!! After what seems like a very short time back home, I am now sitting at the airport waiting for my flight back into Haiti. I am anxious to return, to continue with our efforts in food and shelter distribution. The reports about food distribution in the entire city have been mixed. It is a very big job to feed almost 2 million people; a job that takes very good organization and planning. As a small organization, we are trying to take care of the immediate neighbourhood around the Port-au-Prince church. I was able to get through to Pastor Diogene this morning. He sounded more rested and energetic — thank you for praying for him. As president of the UEBH (Union of Evangelical Baptist Churches of Haiti) Diogene had an office in a STEP Seminary building. That building was destroyed in the earthquake. All the UEBH offices and the STEP offices were in that building. So Diogene has been in a lot of meetings to discuss what direction God would have them go in this area. Please pray for wisdom for Diogene and his UEBH leadership team. Pastor Diogene reported that none of the over 250 pastors in the UEBH had died in the earthquake. However some of them have lost wives and several have lost children and many members of their churches. Diogene has had much opportunity to minister to these pastors. Our food distribution ministry is now reaching out to 15 of these pastors who have not yet received aid from the UN or World Food Program. Each of these pastors has there own “camp” that they are reaching out to with food. Thank you for praying for these pastors as they deal with their own grief and then also minister to so many hurting within their churches. Yesterday Glenn visited several of our schools and churches. He didn’t find any structual damage — however there are small cracks that will need some attention. We are thankful that all of these buildings are still habitable and our school ministry can continue. Pastor Diogene and his ministry team are preparing for the evangelistic crusade that will begin next Monday. They are cleaning up an area close to the PAP church, building a raised area to lead from and putting up some large tarps for some cover. But most of all they are praying for God to open many hearts to the gospel of Jesus Christ. Thank you for being part of this prayer team. Thanks so much for partnering with your prayers and support.